Put on your apron and cook up something delicious as you play free Food Games. Try before you buy! 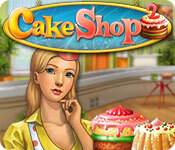 Open up a caf	and earn money while treating your customers to delicious fruitcakes with different fillings in Cake Shop 2!